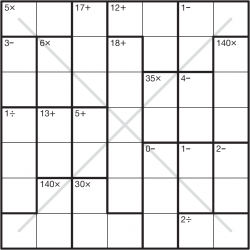 Calcudoku combines the row and column restraints of Sudoku with bold-lined regions that have numerical constraints. Each of these regions must result in the given value when the stated operation is applied between all of the numbers in it. So an 11+ region must contain values that add up to give 11, such as 5 and 6. 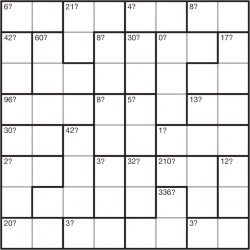 To solve the puzzle you must place 1 to 6, or whatever the size of the puzzle is, once each into every row and column, while obeying these bold-lined region values. 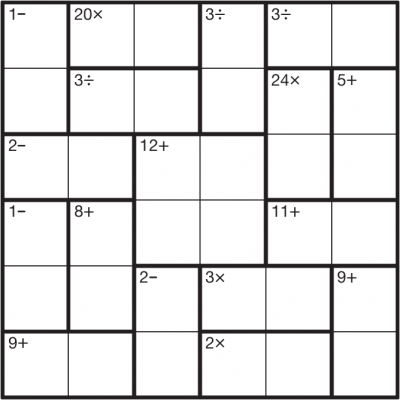 For example, the two values in the 20× region on the first row of the example puzzle on the right must multiply to give 20, so this region contains a 4 and a 5 in some order (since 4×5=20). 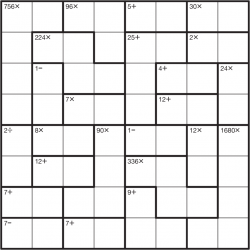 Unlike Sudoku or Killer Sudoku, there is no constraint on repeating numbers in a bold-lined region. 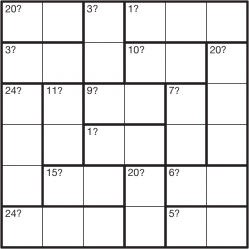 In Mystery Calcudoku you don't know what the operation is (+, -, ×, ÷) and you must work it out - in the samples below these are marked with a question mark for clarity, but often the '?' 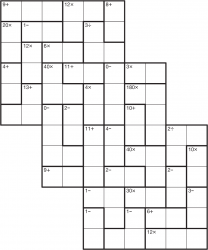 symbol would be omitted in an actual puzzle. 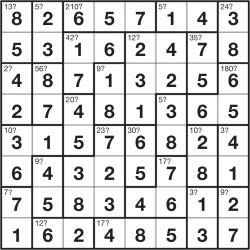 Solving Calcudoku can require a range of tactics - not only those from Sudoku and Kakuro, but also some methods unique to Killer Sudoku, Killer Sudoku Pro and even Mystery Killer Sudoku Pro.